The internet offers a wealth of information as well as misinformation. An internet blog highly critical of the Creation Museum’s new “Lucy” exhibit recently caught our attention. 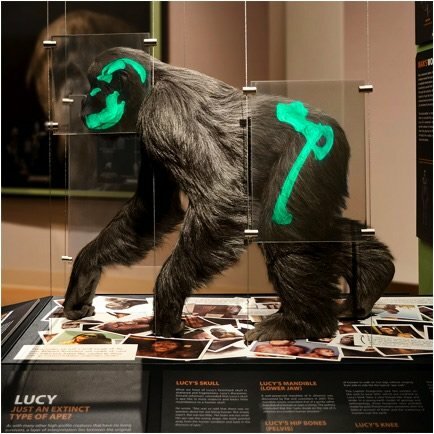 Our exhibit features a holographic representation of Lucy’s fossilized bones in the context of the knuckle-walking ape that evidence suggests she was. The blogger calls the Creation Museum’s Lucy “an abomination” and a “travesty.” He builds a detailed case intended to discredit the exhibit and demonstrate that Lucy was a transitional form between humans and ape-like ancestors. We felt this particular blog, as it contains much misinformation, would be worthwhile examining and refuting in detail, seeing this as an opportunity to address secular allegations that our Lucy reconstruction shows reckless and unscientific reasoning. 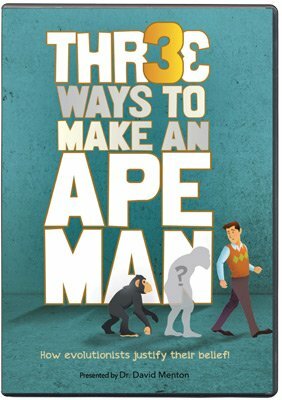 Since the information Benton provides suffers from significant shortcomings, we decided to address these here, providing information for those who might be led astray by the material he cites and exploring some aspects of australopithecine and human anatomy that we haven’t previously written about. Before addressing the blogger’s scientific claims, we should emphasize that he’s never been to the Museum. His evident reliance on hearsay rather than either observation or investigation does not excuse his erroneous statement that the Museum lacks “anything with scientific meat to it.” The Creation Museum presents scientific material throughout, including both biblical and evolutionary interpretations to demonstrate how worldview-based assumptions affect scientific conclusions. Actually, a great deal of evolutionary information is presented in the Museum. Creation scientists and evolutionary scientists both have the same evidence to examine, but they interpret it differently because they have different starting assumptions about the unobservable past. Evolutionary anthropologists, like this blogger aspires to become, assume that molecules-to-man evolution is a fact. They fail to acknowledge that it is actually an article of faith, an untestable belief, that attempts to explain the origin of life without God and denies God’s eyewitness account. I didn’t believe creationists would try and manipulate and mutilate her [Lucy’s] anatomy to portray her as something she is not; in my mind they accepted all of the anatomical and behavioural conclusions about her and just disputed what she should be called. I suppose I was giving too much credit to the creationists, for they went and created this abomination. Their justification for producing such a travesty against evolutionary anthropology is that it’s just a matter of interpretation. Those evolutionary scientific sources cited in the signage illustrate that the community of evolutionary scientists is not quite as committed to the belief that Lucy was not a knuckle-walker as our undergraduate critic believes. Perhaps he would deem the findings and opinions of these educated and experienced evolutionary scientists to be “abominations” and “travesties” also. They often like to claim that their views and science are simply two ways of looking at the evidence, both equally valid. Of course, this forgets that ideas are given more credence when they demonstrate their reliability through hypothesis testing. Whilst science does plenty of that, creationism almost never does; you’ll never see an article with “creationists were surprised by a new finding” because they’re never predicting anything that could be shown to be wrong. As such, science and creationism are far from equally valid ideas. Of course, here the blogger is assuming that creation science is not science. Creation scientists and evolutionary scientists actually do evaluate the same evidence concerning questions of origins and other events in the distant unobservable, unrepeatable past. And because experimental tests cannot be conducted in those realms, data about the unobservable past must be interpreted in accord with a scientist’s worldview. Creation scientists begin with the authoritative eyewitness account of our origins in the Word of God. They realize that any model describing life’s origins or earth’s history must be consistent with that biblical account to even have a possibility of representing reality, but the facts—in this case, the fossils—are the same as the ones the evolutionists deal with. Those are not changed, nor should they be.
. . . Starting at the top we run into our first major problem at the base of the skull. The foramen magnum is the hole the spinal cord comes out of and can be used to work out how an animal walked. A biped will want it at the bottom of the skull so the head can sit atop a vertical body whilst a quadruped will want it further back so their head will still face forwards when placed in front of a body. Stick a biped’s head on a quadruped and it would be looking at the ground, which is not particularly useful for survival. Many seem to think of evolution as a purposeful process. Benton says a “biped will want” its foramen magnum at the bottom of its skull and a “quadruped will want” it elsewhere. But does evolution address wants and needs? Even among evolutionists, this sort of Lamarckian thinking disappeared a long time ago. So, is Lucy’s foramen magnum like that of a quadruped or a biped? Unfortunately we can’t say since it wasn’t preserved. Luckily we do have a couple of Au. afarensis specimens with a preserved foramen magnum. So I made a little graph of their foramen magnum “index” (a measurement of its position) and lo, the position of Au. afarensis foramen magnum falls much closer to that of Homo (including humans) than any quadrupedal ape. However, the angle of that foramen is much more similar to an ape than a human. In other words, the hole is close to the human location but the angle of the hole is more like an ape. Could that mean they were quadrupeds? Well, as the second image shows when the location of the foramen magnum is taken into account as well as the angle, we’re still left with a biped. [see his graph and sketches below] So, the hole for the spine looks like that of a biped (albeit with the retention of some ape characteristics). A.L. 444-2 is exhaustively described in the book The Skull of Australopithecus afarensis.13 W. H. Kimbel, Y. Rak, and D. Johanson spend about 250 pages describing the details of their reconstruction. Though they claim that the foramen magnum has migrated—in the evolutionary sense—to a more anterior position, the actual specimen is extremely fragmentary and incomplete. A.L 444-2’s foramen magnum consists of only small portions of the occipital bones, which border the foramen magnum posteriorly. However, the opisthion (which is the most posterior point of the foramen magnum), the entire front portion of the foramen, and the remaining cranial base in which the foramen magnum is situated are all missing. The authors reconstructed the central cranial base by extrapolating from the reassembled fragments far distant from it.14 The drawings of the A.L. 444-2 (shown here) indicate that the cranial base of the reconstruction, including most of the foramen magnum and the landmarks to which it is compared, are simulated using wax because they are missing. Yet another afareneis skull fossil of potential value in this discussion, A.L. 822-1, was found more recently. Kimbel and Rak, the authors of the book about A.L. 444-2, published a review of A.L. 822-1’s reconstruction in 2010. That specimen was rebuilt from over 200 fragments. It contains only one small portion of the foramen’s margin on a fragment from the right side and another tiny piece (14 mm long) from somewhere near the foramen’s margin but without a direct connection. They did include a photo of the cranial base (see photo) in their paper. Calculating the foramen’s position using the same jaw-ignoring alternate method they used with A.L. 444-2, they obtained similar results. Overall the authors thought A.L. 822-1 was more similar to apes than other skulls, and they speculated this more “primitive morphology” was a result of the fact it was probably female.20 Marked skeletal differences between males and females is typical of gorillas. Thus it may well be that the paleontologists’ bias, reflected in their judgment of where to place the foramen magnum in their reconstruction, has actually introduced inconsistencies with the remainder of the their reconstruction. The angle of the opening remains clearly in the “ape” category. The possibility of error in their bipedally-favorable anterior position for the foramen magnum must be considered. We would submit that the “anterior migration” of the afarensis foramen magnum occurred not deep in the evolutionary history of humanity but quite possibly sometime after 1992 in the laboratory. 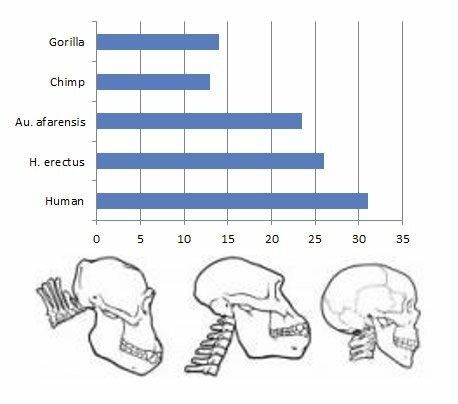 Yet even if the foramen magnum position and angle from this skull is correctly determined to be somewhat displaced from the usual chimp position, does that show afarensis was an intermediate evolutionary form between ape-like ancestors and humans? No. 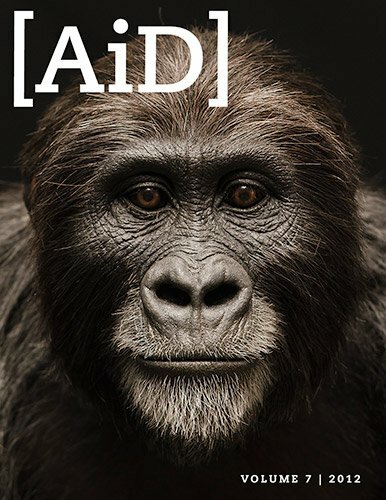 It just means that afarensis wasn’t a gorilla or a chimp. It does not prove it was an evolutionary intermediate. Evolutionary change from one kind of creature into another is an imaginary connecting of the dots. Lucy and the other afarensis specimens do differ in some anatomical respects from living apes. The same can be said of many creatures when the fossils of extinct and living varieties are compared. Such differences are just variations, however, and nothing intrinsic to those differences proves evolutionary progression to higher taxonomic kinds. The next issue arises with the spine itself. Humans have a curved spine (known as lordosis) which acts as a shock absorber as we walk. Chimps lack this curvature, since they don’t walk like us. What of Au. afarensis? Well, it had that curvature too. And that isn’t the result of bias contained in a reconstruction of the spine, Au. afarensis had the additional lumbar vertebrae which produces lordosis (6 compared to the 4 in chimps; although humans only have 5). You can’t misinterpret the number of vertebrae, that’s an absolute, physical number. And another point in favour of bipedalism. The blogger claims that Lucy’s six lumbar vertebrae—more than the average five for humans and four for chimps—show that she had a lumbar (lower back) curvature such as bipedal humans have. (Incidentally, neither Lucy nor any other afarensis specimen actually has lumbar vertebrae to count. But we’ll get back to that important point in a moment.) This lumbar curve (aka lumbar lordosis) is called a secondary curve and is not present in babies. Humans develop the secondary curvature as they learn to move into an upright posture, shifting the center of gravity over the hips. Great apes have only three to four lumbar vertebrae. 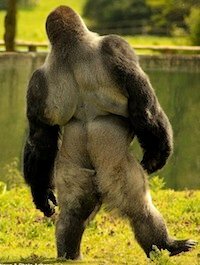 Nevertheless, gorillas have been known to develop a lumbar curve as a result of efforts at walking upright even though they are not habitually bipedal.22 And such a lumbar curve would not be passed on to offspring. Furthermore, an abundance of lumbar vertebrae does not equate to having a lumbar curve; some gibbons have six23 and Old World monkeys can have seven,24 yet they do not ordinarily have human-like lumbar curves. More important to point out here, however, are some anatomical facts about which many people—even undergraduate anthropology majors outraged at the desecration of their favorite fossils—may be ignorant. Trying to count the number of lumbar vertebrae in a fossil is not as straightforward as it sounds. In fact, it’s not even straightforward in the deceased bodies of modern humans. None of these variations provides genetic information needed for upward evolutionary advancement. Thus, while evolutionists claim such variations are the raw material for evolution, comparison of the variants among humans demonstrates the lack of any advantage on which natural selection could act. Furthermore, none of these variations provides genetic information needed for upward evolutionary advancement. 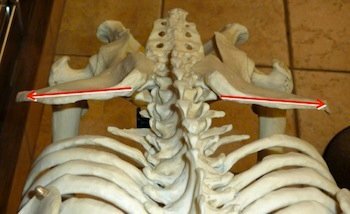 Whether to call the extra vertebrae “lumbar” or “thoracic” is actually a matter of controversy. Many anatomists (even evolutionary ones) believe that vertebrae with “facets” (attachment points) for ribs should be called “thoracic.” Others think that if the bony prominences that orient one vertebra to the next are aligned more like those of lumbar vertebrae, then those vertebrae should be called “lumbar” even if they have attachments for ribs. Such vertebrae may be functioning like lumbar vertebrae, contributing to the normal stability of the lower back, helping form the lumbar curve in those individuals, even though they have ribs attached. However, those who insist on labeling these “thoracic” vertebrae as “lumbar” are typically those who wish to demonstrate an evolutionary progression toward bipedalism by counting up lumbar vertebrae. Martin Haeusler’s exhaustive re-examination of the fossil evidence for six lumbar vertebrae—taking all the definitions for “lumbar” into account—has refuted the contention that early hominids had six lumbar vertebrae.31 “The discovery of a partial last rib that articulates with the sixth” supposedly-lumbar vertebra of Robinson’s Sts 14 africanus fossil demonstrates that it only had five lumbar vertebrae.32 And re-examination of the supposed “sixth” lumbar vertebra from the Homo erectus fossil actually shows the orientation of the bony projections that align it with other vertebrae; these projections prove its extra “lumbar” vertebra is really thoracic.33 So that Homo erectus only has five, the usual human number. (Actually, having six would not be a problem anyway; in fact, 2–8% of modern humans have six.34) Thus, despite the blogger’s bold assertion about the number of vertebrae being an “absolute, physical number,” actual understanding of the anatomy involved demonstrates the limits of his knowledge on this topic. A Slap on the Wrist? The next issue is raised by the hand itself. Being used as a limb, knuckle walkers will obviously have a suite of different adaptations to us. Their hand is more robust and sturdy than ours, allowing them to easily walk on it. Naturally, we lack many of these abilities in favour of fine motor control. We can’t support our weight for extended periods of time but we can manipulate things with greater dexterity. And what of Au. afarensis? Although some might try and use the fact knuckle walking “cannot be excluded” as a way to weasel out of the fact there’s no evidence they knuckle walked, the fact remains there is no evidence they knuckle walked. Not being able to exclude it is kind of moot when we have no reason to include it in the first place. As such, I’d go further than the paper itself and simply state there’s no evidence of knuckle walking. Evolutionists have, however, found such evidence for knuckle-walking. A more recent study by evolutionists Richmond and Strait confirms Lucy’s bones do have the features required to lock the wrist for knuckle-walking.35 Incidentally, this particular study is one of several plainly referenced in the Creation Museum’s Lucy exhibit. A Slip of the Hip? Lastly, the blogger points to the pelvis. As a counter-proof to his photo of the Creation Museum’s knuckle-walking Lucy, which he captions “What has been seen cannot be unseen,” he provides a set of crude drawings captioned, “But I will show you a picture.” The drawings are intended to demonstrate Lucy’s pelvis is more like a human’s than a chimp’s. His sketches fail, however, to illustrate the key portion of the pelvis that determines the efficiency of bipedal locomotion—the orientation of the iliac blades. Finally we arrive at the hip. In a video associated with their ridiculous reconstruction they try and argue that the gluteus medius of Au. afarensis would not have been able to function properly given the orientation of their hips. Yet numerous computer models of Au. afarensis have shown that their gluteus medius can and does function during bipedal locomotion. Although it has to work a bit harder in Lucy et al. than in us because their hip is not as efficiently built as ours, there is no fundamental difference in the manner by which they move. Ok, so their reasoning might be wrong. But maybe their observation that Lucy’s hip is like that of a chimp is valid? Well this should be reasonably easy to figure out since human and chimp hips are very distinct. Ours is shaped like a bowl so that our vertical torso can “sit” in it and receive support whilst a chimp hip is a lot taller and flatter to keep their back rigid with minimal effort. I shan’t tell you which one it most looks like, because that would just be my interpretation shining through! Almost every bit of Lucy’s anatomy points towards bipedalism. Her hip is 3D to support a vertical trunk, her foramen magnum is located on the bottom of the skull to enable her head to sit atop a vertical body. Her hands show know [sic] evidence for knuckle walking whilst her spine is curved to best function in a bipedal body. Creationists might cry out about interpretation and bias, but the fact of the matter is that their reconstruction is simply wrong on every major point. Also, note how in most characteristics she is very similar to a human but not quite human. Many of her attributes also show a significant affinity with chimps such as the angle of the foramen magnum and her hip not being quite as efficient as ours. It’s almost like Au. afarensis is some half ape/half man form. Like she’s some kind of . . . intermediate, transitional stage. Funny that. There has been a good deal of creative analysis by many in an effort to accurately reconstruct the afarensis pelvis. Evolutionists—Stern and Susman in 198336 as well as Russell Tuttle37—have noted that Lucy’s iliac bones were oriented as a chimpanzee’s. 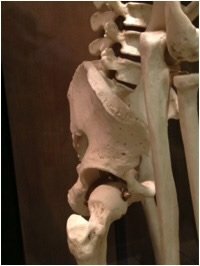 We discuss Owen Lovejoy’s and Christine Berge’s reconstructions of the afarensis pelvis in our article “A Look at Lucy’s Legacy.” Technology required to arrive at various conclusions has ranged from Dremel tools to sophisticated imaging techniques. Ultimately, Berge distinguishes a sort of “australopithecine bipedalism” distinct from the truly efficient bipedal gait of humans. Berge’s reconstruction also demands Lucy’s gluteal muscles be arranged like an ape’s. This arrangement, while enabling an australopithecine to move its legs in unique ways, would still be too unstable for sustained bipedal locomotion. In these views of the human pelvis, note the forward-curving orientation of the iliac blades. 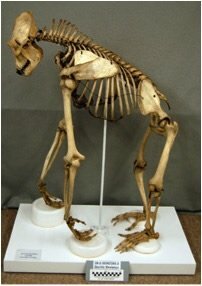 Compare to the straighter, more laterally-oriented iliac blades of the chimpanzee, gorilla, and Lucy. 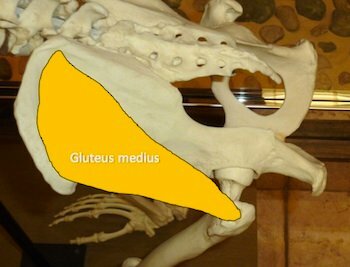 Because the crest of the human iliac blade curves, the gluteus medius muscle attached to it is oriented differently than in an ape. The curved iliac blade allows the muscle to reach the greater trochanter of the femur from a different angle. When the human’s gluteus medius muscle contracts, it abducts the thigh, pulling it out to the side. Because this muscle contracts on the “standing” leg during walking, the thigh doesn’t actually move out the side. Instead, the muscle tugs the standing leg sidewards just enough to maintain balance when the other leg is lifted to walk. Thus a human is able to walk with an efficient coordinated bipedal gait. The chimpanzee’s iliac blades are oriented like Lucy’s. 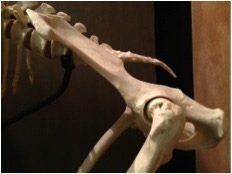 In the chimp pelvis, the iliac blades point straight out to the sides. Visible directly beneath each iliac blade in the view from the top is the greater trochanter of the femur. To this knobby projection the gluteus medius muscle attaches. 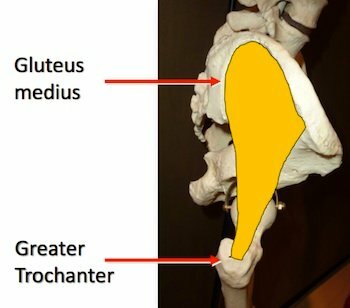 Because the gluteus medius muscle connects the top of the iliac blade to the greater trochanter of the femur in a straight alignment down the back, contraction of the muscle extends the thigh backwards. The muscle cannot abduct the thigh sidewards like a human’s with this arrangement. 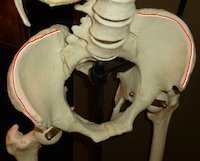 The orientation of the iliac blades on the pelvis is a key skeletal requirement for bipedality. Notice this in the photograph of our holographic representation of Lucy and compare to those of a chimpanzee, a gorilla, and a human. The orientation of the iliac wings on the human pelvis allows the human to use gluteal muscles to counterbalance the lifting of the opposite leg during bipedal walking. This stabilizes our hips and keeps us from falling over sideways with each step. The differing orientation of ape iliac bones prevents this use of the gluteal muscles and forces apes to shift and sway from side to side when they occasionally walk upright, rendering an efficient bipedal gait skeletally impossible. Lucy, like a modern ape, was not equipped for sustained, habitual, or efficient bipedal locomotion. An ape’s iliac blades are not oriented to allow its gluteal muscles to abduct (to pull its standing leg out to the side), so bipedal walking for an ape can only be an acrobatic maneuver. The ape tends to fall to the side when walking upright and may swing and sway to avoid falling over, as illustrated by this gorilla, known for his crowd-pleasing efforts to walk upright. Image credit Denise Hardy/Solent News & Photo Agency from Dailymail.–U.K. 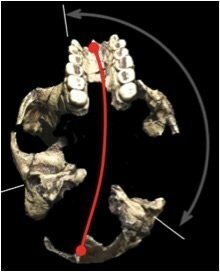 Of course the blogger does not claim Lucy was in all ways human but only that “in most characteristics she is very similar to a human but not quite human.” He extrapolates from “similar” and “not quite” to claim indisputable proof of bipedal evolution from ape-like ancestors through Lucy to humans. We believe a more reasonable course would be to note that Lucy appears to be an extinct ape with some anatomical variations not seen in living apes. Anatomical variations, however, do nothing to threaten biblical authority or to support evolution. Living apes are able to achieve a bipedal gait, but it is not their habitual gait because they are not designed for efficient bipedality. Lucy’s anatomy may suggest a gait that differed somewhat from that of the chimp, but on its best day it was not actually bipedal. In fact, her anatomy is quite consistent with that of a knuckle-walker. But even if Lucy and her cousins had a more versatile anatomy than some other apes, tiptoeing through the jungle didn’t make anything ape-like turn into a person. Nothing could. God created Adam and Eve, the first humans, in his image the same day He created apes. We have His own Word on the subject. The authoritative reliable answer to “where we came from” is in fact readily available in the Word of God. About 6,000 years ago, according to the Word of the only eyewitness—God, Himself—God created the world, the universe, and all life. We know that He did not use evolution by His plain statements that He made each kind to reproduce after its kind. We also know He made human beings unique, in His own image, accountable to Him and needing Him spiritually in ways animals cannot. Thus it is important that people understand the truth about “where they came from.” Knowing their real origins and what God says about their past, their nature, and their future can help them trust the God who made them. That same Creator God offers eternal salvation from the guilt of sin and the sinful nature that we all have as Adam’s descendants. Jesus Christ, the Son of God, pointed out the connection between understanding the truth about our origins and believing in Him when he said, “For if you believed Moses [who under God’s inspiration wrote Genesis], you would believe Me; for he wrote about Me. But if you do not believe his writing, how will you believe My words?” ( John 5:46–47 ). “About the Blog,” Filthy Monkey Men (blog), http://www.evoanth.net/evoanth/. “About the Blog.” Incidentally, our recent Google search of the phrase “human evolution” produced 230,000,000 results, so there doesn’t seem to be such a paucity of sources. All quotations, unless noted, are from “Lucy, the Knuckle-walking Ape—Misguided Mondays,” Filthy Monkey Men (blog), August 13, 2012, http://www.evoanth.net/2012/08/13/lucy-the-knuckle-walking-ape-misguided-mondays/. Our willingness to accept scientific claims that are against common sense is the key to an understanding of the real struggle between science and the supernatural. We take the side of science in spite of the patent absurdity of some of its constructs in spite of its failure to fulfill many of its extravagant promises of health and life, in spite of the tolerance of the scientific community for unsubstantiated just-so stories, because we have a prior commitment, a commitment to materialism. It is not that the methods and institutions of science somehow compel us to accept a material explanation of the phenomenal world, but on the contrary, that we are forced by our a priori adherence to material causes to create an apparatus of investigation and a set of concepts that produce material explanations, no matter how mystifying to the uninitiated. Moreover, that materialism is absolute, for we cannot allow a Divine Foot in the door. Richard Lewontin (Harvard University geneticist), “Billions & Billions of Demons,” New York Times Book Reviews (9 Jan. 1997), p. 31 (italics in the original). The review is of Carl Sagan’s book, The Demon-Haunted World: Science as a Candle in the Dark (Random House, 1997). See “The Collapse of the Canopy Model.” Our website maintains a section called “Arguments Christians Shouldn’t Use,” in which models that are either biblically inconsistent or scientifically flawed are rejected. See “‘Junk’ DNA—Past, Present, and Future” Part 1 and Part 2, Junk DNA Is Not Junk (DVD), and “ENCODE and the Dark Matter of the Genome” Part 1 and Part 2. W. H. Kimbel, Y. Rak, and D. Johanson, The Skull of Australopithecus afarensis, (New York: Oxford University Press, 2004), 44. Adam Benton, “Lucy, the Knuckle-walking Ape—Misguided Mondays,” Filthy Monkey Men (blog), August 13, 2012, http://www.evoanth.net/2012/08/13/lucy-the-knuckle-walking-ape-misguided-mondays/. W. H. Kimbel, Y. Rak, and D. Johanson, The Skull of Australopithecus afarensis, (New York: Oxford University Press, 2004). “A substantial part of the central axis of the cranial base from opisthion to nasion is missing in A.L. 444-2 (Figure 2.3 a and b). However, the inclination and orientation of the petrous elements of the temporal bones, the remains of the orbital roofs (the floor of the anterior cranial fossa), and the lateral part of the floors of the middle cranial fossae facilitated a reliable reconstruction of the missing parts of the central cranial base.” W. H. Kimbel, Y. Rak, and D. Johanson, The Skull of Australopithecus afarensis, (New York: Oxford University Press, 2004), 42. W. H. Kimbel, Y. Rak, and D. Johanson, The Skull of Australopithecus afarensis, (New York: Oxford University Press, 2004), 38. “A short segment of the foramen magnum margin just anterior to opisthion is present bilaterally (6.0 mm long on the left and 10.5 mm on the right), but opisthion itself is missing.” W. H. Kimbel, Y. Rak, and D. Johanson, The Skull of Australopithecus afarensis, (New York: Oxford University Press, 2004), 16. “The major contributor to the short basiooccipital segment appears instead to be the anterior migration of the foramen magnum. The crowded appearance of the center of the cranial base in A.L. 444-2 stems primarily from the extremely anterior position of the foramen magnum in relation to the quadrilateral of the four foramina.” W. H. Kimbel, Y. Rak, and D. Johanson, The Skull of Australopithecus afarensis, (New York: Oxford University Press, 2004), 111. This was reported in Journal of Anatomy and Physiology, a publication of the Anatomical Society of Great Britain and Ireland, 24 (1890): 48–50, describing previous work by D. J. Cunningham as well as original work by Dr. Johnson Symington. On dissection the curve was found to result from alterations in the shapes of the intervertebral discs, presumably remodeled as a result of the animals’ behavior rather than any heritable feature. M. Haeusler, S. A. Martelli, and T. Boeni, “Vertebrae numbers of the early hominid lumbar spine,” Journal of Human Evolution, volume 43 (2002): 621–643. C. O. Lovejoy, “The natural history of human gait and posture Part 1. Spine and pelvis,” Gait and Posture 21 (2005): 95–112. M. Haeusler, S. A. Martelli, Thomas Boeni, “Vertebrae numbers of the early hominid lumbar spine,” Journal of Human Evolution, volume 43 (2002): 621–643. Martin Haeusler, Sandra A. Martelli, Thomas Boeni, “Vertebrae numbers of the early hominid lumbar spine,” Journal of Human Evolution, volume 43 (2002): 621–643. K. K. Whitcome, “Functional implications of variation in lumbar vertebral count among hominins,” Journal of Human Evolution, 62 (2012) 486–497, describing the conclusions from Martin Haeusler, Sandra A. Martelli, Thomas Boeni, “Vertebrae numbers of the early hominid lumbar spine,” Journal of Human Evolution, volume 43 (2002): 621–643. That investigator, Martin Hausler, contends the evolutionary common ancestor of apes and humans had five, and that each species evolved to have the number most suited to its lifestyle. Great apes have three to four lumbar vertebrae, and other primates have as many as seven. Evolutionists like Haeusler believe that australopithecines evolved only five vertebrae, the same as the average number in humans.30 Incidentally, having lots of lumbar vertebrae serves more functions that allowing the spine to curve—they also have functions in arboreal creatures. Having lots of lumbar vertebrae does not mean an animal had a lumbar curve. The one additional Au. africanus specimen (Stw 431) to have been suspected of having six lumbar vertebrae by some is so fragmentary that investigators differ in how to glue it back together, so no one is sure how the articulation points with other vertebrae should really be oriented. Furthermore, re-examination of the questionable sixth vertebra of that specimen has additional features identifying it as thoracic. Martin Haeusler, Sandra A. Martelli, Thomas Boeni, “Vertebrae numbers of the early hominid lumbar spine,” Journal of Human Evolution, volume 43 (2002): 621–643. Brian Richmond and David Strait, “Evidence that humans evolved from a knuckle-walking ancestor,” Nature 404 (2000):382–385. J. T. Stern and R. L. Susman, “The locomotor anatomy of Australopithecus afarensis,” American Journal of Physical Anthropology 60 (1983): 279–317.